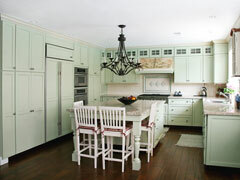 Kitchen furniture can be found in many styles and materials. It should not only look attractive but also be comfortable enough that family and guests will sit and visit before or after a meal. A table may be surrounded by chairs or pushed up to a built in seating area. Also available are freestanding kitchen islands that look like fine furniture; their wood and color may vary from your cabinets. Stools in a variety of styles suit any decor and make tasks or visiting at your island or peninsula comfortable. Open storage pieces show off your china and give the kitchen a dressed up appearance. Be sure to provide space for your prized cookbook collection with built-ins or bookcases. When choosing portable kitchen furniture, be sure to consider whether the cabinet styles and materials match (or at least complement) your kitchen cabinet style and construction. In addition, the portable furniture hardware and top surfaces should co-ordinate with the style and finish of your kitchen cabinet hardware and counter tops. The photo at the top right of this page shows a white pedestal table with traditional wooden chairs. 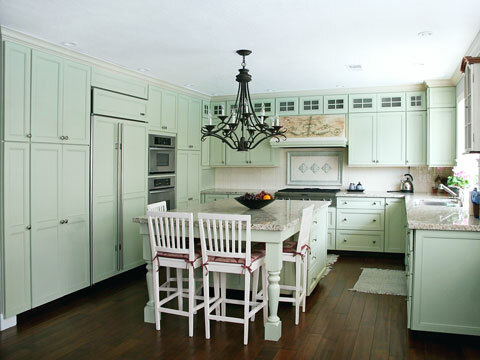 The photo to the left illustrates a country kitchen with white cabinets and furniture, while the picture to the lower right shows cast iron stools in a contemporary kitchen. Since the kitchen is a place of food preparation, spills may be unavoidable. 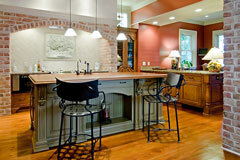 Kitchen furniture should be sturdy and easy to clean. Fabrics used for cushions and upholstery should be washable. When cooking, keep unnecessary furniture such as chairs out of the cooking area. 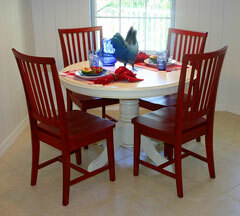 Use dining furniture in a separate space. For a small kitchen, bulky furniture may be too large, so go with lighter pieces to maximize floor space and ease traffic flow. Choose flexible furniture such as a table with fold-down leaves or chairs that can stack out of the way when not needed. Lastly, consider built-in furniture for your kitchen, but remember that it is not moveable, and you can't take it with you if you relocate. 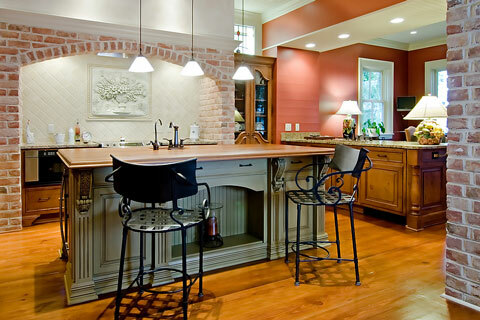 At KitchenFurniture.us, you will find a convenient directory of kitchen furniture manufacturers and dealers. Select from a wide variety of kitchen furnishings and accessories at Target; find beautiful kitchen furniture, islands, and butcher blocks at the Chef's Resource.